Studio A combines Blue Light’s live room, vocal/drum booth, and control room to provide a fully equipped, great sounding, and comfortable studio space. Paired with the our wide selection of vintage and modern microphones, Studio A is suited for projects large and small and offers a wide selection of sonic options. 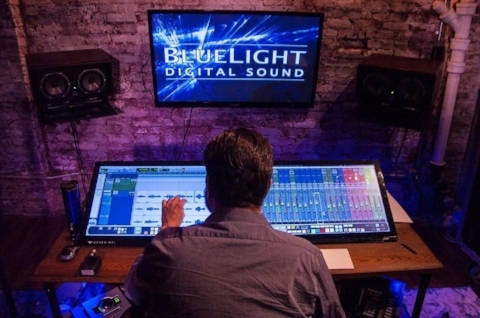 Capable of recording 24 simultaneous channels, Blue Light’s 600 square foot live room features 20 foot high ceilings and features a variety of surfaces including a large exposed brick wall and re-positionable acoustical treatments . An assortment of instruments, amps, pedals, and percussion equipment are on hand to inspire creativity. Blue Light’s vocal/drum booth is acoustically treated to provide tight, focused sound for recording up to 16 channels. A clear line of sight between the live room and control room ensures that clients are always within view of their fellow musicians and studio staff. A 40" flats screen monitor mirrors the control room screen or provides ample real estate for lyrics and notation. Blue Light’s control room is equipped with a 32 channel analog recording console, SSL conversion, and Pro Tools 12 running on a New Mac Pro computer. A 51 inch flat screen monitor ensures that musicians, engineers, and producers have a clear picture of the tracking, editing, and mixing process. Our great selection of outboard gear provides analog character, complemented by a variety of plug-ins from the industry's most recognized names.